UPDATED: The Democrat has emerged as one of the key legal challengers to the policies of the Trump administration. 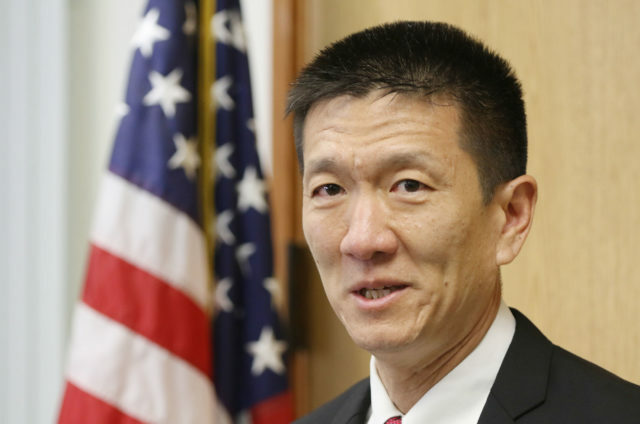 (AP) — Hawaii Attorney General Douglas Chin, who has been fighting President Donald Trump’s travel ban and other policies over the past year, has announced he will run for U.S. Congress. Chin, a Democrat, seeks to replace Hawaii U.S. Rep. Colleen Hanabusa, who is running for governor. Hanabusa is also a Democrat. Chin made the announcement Monday saying that the last year of legal battles over White House actions sparked him to run for the U.S. House seat. Hawaii Attorney General Doug Chin has joined a crowed field of candidates for the 1st Congressional District seat. Chin has been a vocal opponent of decisions by Trump’s administration. Chin told The Associated Press in a telephone interview Sunday that he first considered running for office while listening to a Sessions speech. A week after taking office, Trump issued an executive order aimed at temporarily banning travel from seven Muslim-majority countries. On Feb. 3, the state of Hawaii sued to stop the ban. Trump’s executive order keeps Hawaii families apart and keeps residents from traveling, Chin said. “I think we live in very extraordinary times, I think Hawaii’s progressive values that it fought for for the past decades has been under attack in a lot of different ways, and I’ve experienced it first hand, starting with the travel ban and then extending to attacks on transgender people in the military or the children of immigrants,” Chin said. Chin has sued over every version of the travel ban, calling the measure discriminatory toward Muslims. Hawaii argued that the ban discriminates on the basis of nationality and would prevent Hawaii residents from receiving visits from relatives in the mostly Muslim countries covered by the ban. “It’s the daily attacks on people’s civil rights and the attacks on different protected classes that really motivates me,” he said. Chin said affordability in Hawaii and the state’s strategic military importance would also be major issues if he were elected to Congress. Chin is the son of Chinese immigrants who came to the U.S. in the 1950s. His father was an interpreter for the U.S. during the Korean War, he said. Chin is married with two children. He was appointed to be Hawaii’s attorney general in 2015. Several Democratic lawmakers have also announced they would run for the seat, including state Sen. Donna Mercado Kim and Rep. Kaniela Ing, as well as Honolulu City Councilman Ernie Martin. Ing told the AP on Monday that he is concerned about corporate funding of other candidates, including Chin, and said that his campaign is the only one in the state not accepting any corporate money. Ing said he is running on issues that matter most to people in Hawaii. Ing is also an opponent of Chin’s views on the military in Hawaii, saying that the military presence in the islands not only makes the state a target from threats like North Korea, but also hurts housing affordability for locals. Kim, who represents Kalihi and Moanalua, touted her 35 years of experience in state and city government. “Someone with the tenacity to be able to make sure Hawaii’s agenda is first and foremost,” said Kim, a former state Senate president. Her priorities in Congress would be health care, caring for the elderly, making higher education affordable, veterans’ care and women’s issues including access to contraception, she said.